Cut the kernels off the corncobs and transfer to a blender; reserve 3 of the cobs. Puree the kernels until smooth, 1 to 2 minutes. Strain the puree through a fine sieve set over a medium bowl, pressing on the solids; discard the solids. You should have about 1 cup of corn juice. In a medium saucepan, whisk the corn juice with the goat milk, heavy cream, honey, vanilla bean paste, thyme sprigs and 1/4 teaspoon of salt. Add the reserved corncobs and bring to a simmer over low heat. Remove from the heat and let steep for 10 minutes, then discard the corncobs and strain the panna cotta base through a fine sieve set over a medium bowl. In a small bowl, sprinkle the gelatin over 3 tablespoons of water and let stand until softened, about 3 minutes. Whisk the gelatin mixture into the strained panna cotta base until dissolved, then strain again through a fine sieve set over a large measuring cup with a spout. Lightly grease six 6-ounce ramekins with nonstick spray and set them on a rimmed baking sheet. Fill the ramekins with the panna cotta base, cover and refrigerate until set, at least 4 hours or overnight. In a medium bowl, toss the blackberries with the sugar, lemon zest and juice, the thyme leaves and a pinch of salt. Let stand until juicy, about 1 hour. Run a knife around the panna cottas and invert onto plates. 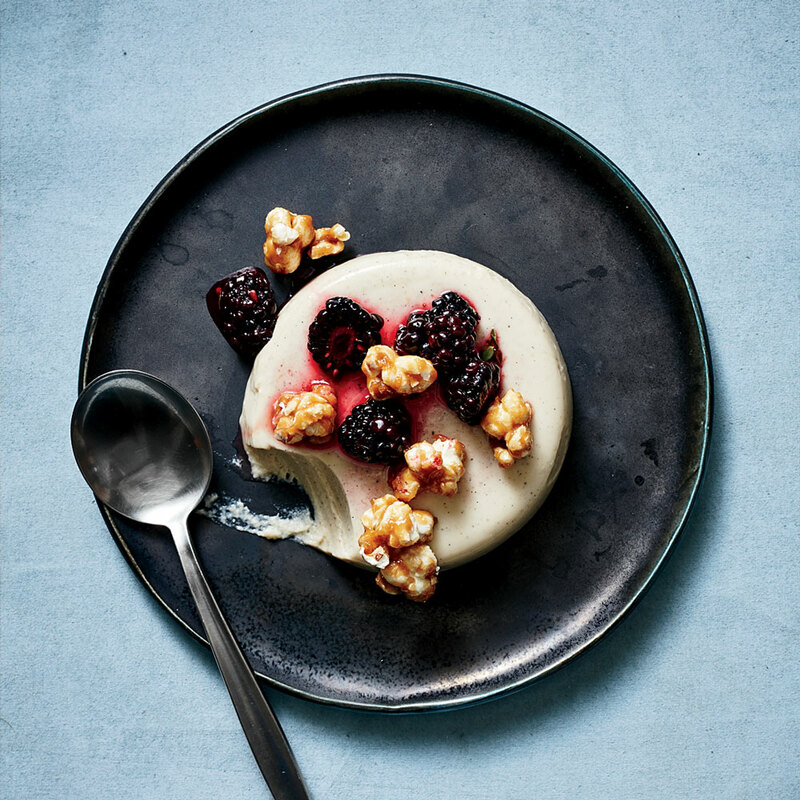 Top with the blackberries and caramel corn; serve immediately. Fresh goat milk is available at specialty food markets.